In January, James Marshall finds a few small gold nuggets in the mill race of John Sutter's sawmill at Coloma, in the heart of what would soon be called the Motherlode Region. Word of the discovery spreads like wildfire and one of the largest human migrations in history begins as more than 500,000 people descend on the California goldfields in what would later become known as the California Gold Rush . Not long after Marshall's initial find, gold is discovered farther north along the Feather and Trinity Rivers of California and many would-be miners leave rich "diggings" for these newly discovered mines. 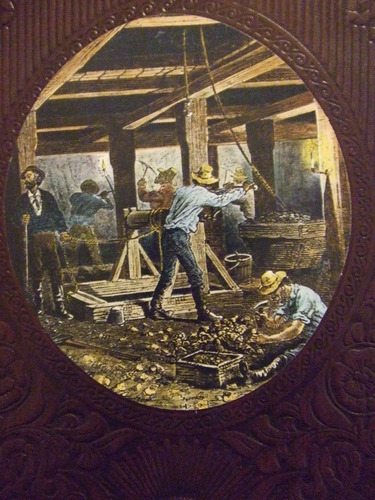 The Gold Rush is in full swing in California and a new breed of eager, mostly inexperienced placer gold miners called "49ers" swarm the foothills of the Sierra Nevada Mountains from Mariposa in the south to newly founded mining camps near Grass Valley and Nevada City (and points beyond) now called the "Northern Mines." At Mariposa, in the so-called "Southern Mines," some enterprising miners trace the source of the placer gold to rich gold veins in the foothills above the watercourses in what would become a precursor to lode or "hard rock" mining. California gains statehood and rich gold-bearing quartz is discovered at "Gold Hill" at Grass Valley. Hardrock mining rises from its infancy to become a major industry in the state at locations like the Empire Mine and will continue in California for another century at various locations: north, south, east, and west. The "Kern River Rush" is on when significant amounts of placer gold are found in and around Greenhorn Creek in the upper reaches of the Kern River region. California's annual gold production surpasses 80 million dollars with gold "spotted" at $20.00 per troy ounce. Hydraulic mining using high-pressure hoses and huge "monitor" nozzles similar to water cannons is first employed at American Hill just north of Nevada City and untold tons of rich bench gravels (along with trees, foilage, and everything else) are knocked down from hillsides to be run through "long toms." Eventually, this terribly destructive mining practice will be outlawed in California. 1853, Discovery of the "Great Blue Lead"
Evidence of the Motherlode's "Great Blue Lead" is discovered near Placerville and and other locations in and around the Northern Mines. These ancient and extremely rich Tertiary Period bench gravels soon become the focus for major placer mining operations. Placers in the Southern Motherlode region near Columbia begin to yield vast amounts of gold. Some 49ers leave the still relatively rich California mines to head for the Fraser River in British Columbia after rumors fly that even richer diggings are to be had there. 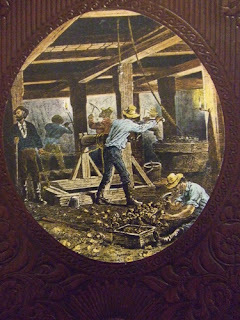 1854, Carson Hill Coughs Up the "Big One"
A single mass of gold weighing 195 troy pounds (2,340 troy ounces) is unearthed at Carson Hill in Calaveras County. This is the largest mass of gold or "nugget" ever found in California. Unfortunately, this spectacular and priceless find is soon melted down to provide gold for bullion and coinage. Although streambed placer mining will continue unabated until the early 1860s, most of the Motherlode's rich surface placer deposits are largely "played out" and miners begin the much harder work of recovering gold from "leftover" bedrock and bench gold deposits. It's the beginning of the end for the California Gold Rush. The now-famous 54 troy pound (648 troy ounces) "Willard Nugget" is found near Magalia in Butte County.